Home » » What's on your Christmas wish list? Finding true love? A clean credit report? A new iPhone? Share your holiday wish list with us in the comments for a chance to win a $25 Amazon Gift Certificate! **This drawing has ended. Congrats to Tom Heald, our winner. Thanks to everyone who participated! Make sure you pick wisely, because this year's hot item might be next year's trash. No one knows this better than Elmo, who used to dominate Christmas wish lists but now... well, let's see what he's up to. Elmo loves to start the day with a refreshing shower and some snuggling time with his Daisy towel. 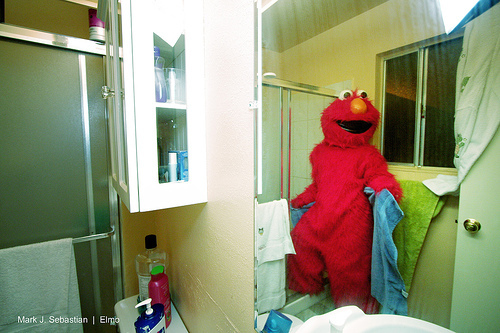 During the busy Christmas season, the Tickle Me Elmo factory hired a lot of new workers. One day, the factory foreman noticed the production has gone down considerably, and the dolls all had weird defects on them. The foreman went to the production line to check up on the new workers. When he got there, he saw them desperately trying to glue little pieces of fabric and marbles to the Tickle Me Elmo dolls. "No you nitwits!" said the foreman to the new workers. "I said give each doll two TEST TICKLES!" 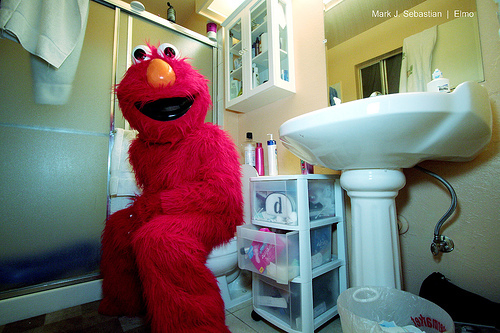 Elmo can't poop (thanks puppeteers!) but he does need to wait two hours for his hair gel to set in. 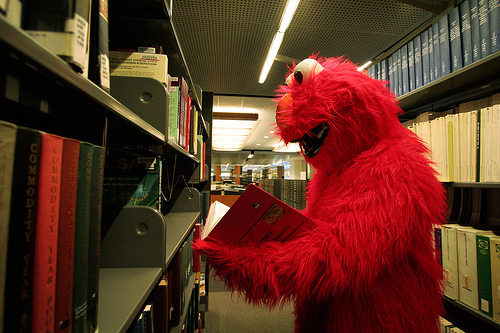 Elmo checking out the world's largest copy of The Catcher in the Rye. 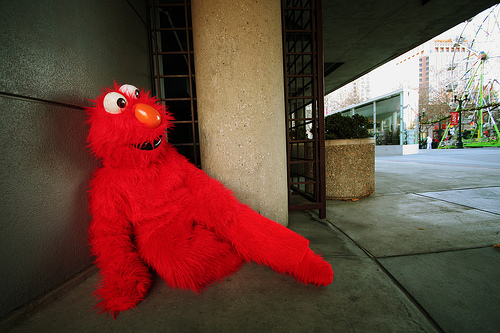 As someone with lots of fur, Elmo cares a lot about global warming. 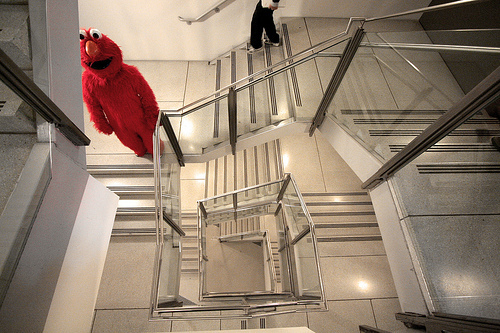 Elmo enjoying an M.C. Escher moment. "My work is a game, a very serious game." 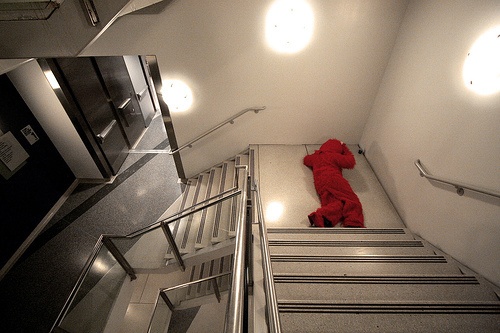 Taking a nap or tasered by the reddit alien? "Help me! I don't have eyelids and I haven't slept for 35 years!" Thanks for the memories Elmo. If only more people try to revive their old toys, maybe you wouldn't have so much free time on your hands. Leave a comment and you will be automatically entered in our weekly drawing to win a $25 Amazon.com gift certificate. Deadline to enter is 12/2/07. Only one entry per person will be counted. P.S. Special thanks to Mark Sebastian for giving me permission to use these wonderful photos. 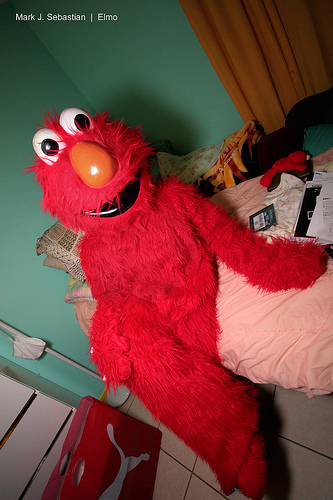 You can check out his complete set of Elmo pictures here. Those are hysterical :) My wishlist is actually on Amazon- it's a very useful feature. I've got an assortment of books I'd like to read, some photography accessories and a new lens that would be wonderful for me to use for work & our upcoming travels this year. Thanks for the giveaway! my wish list is a registry for my trip to india this winter, so my friend and family can help me do more things while i am there! This year, I really want the book "On Writing Well". I'd love to improve my writing style, and I think that this would be really helpful. I'm unlikely to get it from any of my friends or family though, so I may look for it in the New Year. I really want a KitchenAid stand mixer. There are a few other things, but that's the big one. I also want world peace, universal health care, and Santa Clause's sleigh. This year I just handed my partner a "Honey Do" list- all the small fixits I want done in the house. She has a one month time frame 'til Christmas to get it done. Some things will require small hardware store purchases (get new face plate on light switch- type repairs), but most are just fixer upper jobs. I told her to not even consider buying me anything since I just bought myself a new winter coat and some other clothes items on sale. She on the other hand, will be getting a new recliner and an equitable amount of clothing as I bought myself. i dont have much on my list this year, only a handful of books my library doesnt have. got my chin up though. but hopefully not to take a hit on it. I want a car with decent MPG. Our SUV has no trade in value and we need it for when my husband is on call if there is bad weather. I hate dumping almost $70 into the tank just to get the kids to school (no bus service) and running errands a few times a week. Since I am recovering from Bankruptcy, I would love a new flat screen TV with a built in DVD player. I don't have cable, only get about 4 TV channels, my current TV is 10 years old and has a 12 screen and last night the DVD player decided to die. I guess when it rains it pours, I'm looking for a little sunshine on this rainy monday. I hope to get some books on writing as well. I have asked for Steven King's new writing book, and "On Writing Well." I would also love to get a snowblower, but that may not fit under the tree. I'd like some money towards tuition or books in my 'finally getting that degree' project. I have found this to be a two-steps-forward, three-steps-back endeavour, but somehow that just makes me more determined! 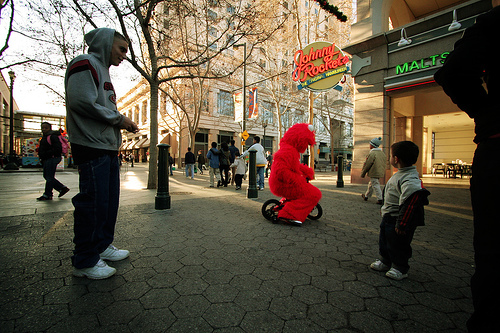 The Elmo pics are hilarious! I'm sick of Santa stealing the show, I'm not a religious man but I wish people would remember who's birthday we are celebrating and what ideals he stands for. Certainlly not consumerism and greed. I think all I want for Christmas is for Santa to fade away. Shelves for my books. Shelves for the kids clothes. Shelves for toy storage. I actually have two. I wish my daughter gets a good job and saves enough so that she and her husband and the two kids can move into a place of their own. My second wish is that Santa brings me a new water heater to replace the once that broke the day the kids moved back in with us! Looks like the holidays will be lean at our house but on the bright side ... we have each other!! Happy holidays everyone! my husband and i started off with budgeting recently and one of the things we have done is cutting down on eating out and making meals at home and we eat a lot of flour based dishes so i want a kitchenaid mixer now so that cooking is a little easier. A chest freezer, so I can stock up on freezer food. My apartment fridge's freezer is tiny! Like an earlier commenter, I'm also wishing for a freestanding freezer. I just got married on Nov. 17, so that's covered. Things are going well for me financially, so that's covered, too. For the first time ever, I find myself wanting a Nintendo; specifically, a Nintendo DS and the BrainAge and Flash Focus games. Well done, Nintendo, marketing to the middle-aged. My wishlist is full of boring everyday items that I need. For example new slippers since mine are quite worn and stocking for work. The only big ticket item on my list is a digital camera so I can start listing items on eBay and Etsy without having to borrow someone elses. fun post!!! who doesn't love Elmo?! "that would be an amazon gift certificate to buy books....books....and lots of books"
There ARE some good ways to get rid of last year's toys as well as other items cluttering up your home aside from the obvious yard/garage sale (and without them going to the landfill.) Even if they aren't the "IT" item of the season, someone will probably still want it as long as it isn't in terrible condition. You can sell your items using: craigslist.com, cheapcycle (look for a yahoogroup in your area), ebay, amazon.com, or half.com. You can give your stuff away using: freecycle (look for a yahoogroup in your area), Salvation Army, and Goodwill. ...but we just moved to a much colder climate. So my wish list is full of necessities that we didn't really need before. That's it. Like I said, it's boring, but let me tell you it's been really cold getting out of the shower in the morning these days! I'd really like a humidifier and a back rub. Wait, I think I forgot to put back rub on my official list! I'm very excited about my new Sony CR220 laptop coming to my house this Friday---that was my main wish! 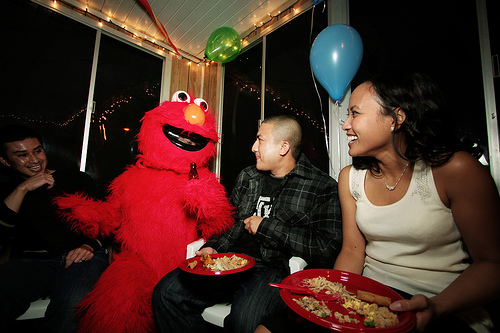 "Haha, Will, is that you in the Elmo costume?" I could go for a replacement Red-Sox cap, my cap of four years is close to retiring. Or guitar hero III, that would be an awesome gift to last a long time. The one of my biggest Christmas wish would be to not be in debt for education. That alone would make Christmas a blast. Not to mention having the family around! I'd like the ability to teleport, and an extra copy of the planet to set aside as a park. Dream big, right? I'd settle for people making conservation a priority. For material items? I'd like a couple of nice shirts, which would make it easier for me to look like a well-dressed grown-up rather than a lazy university student or a construction worker. I'd like my young brother-in-law to actually read and heed the book we are giving him for Christmas (Dave Ramsey's "The Total Money Makeover"). We might've gotten him something else, but we just sent him almost $100 so that the electric company wouldn't shut off his power. So for Christmas, I just want a little more financial responsibility in the folks around me. All I really want for Christmas.... all of our remaining soldiers, who are abroad helping to make the world safer, to come home to their families. I can't think of anything better. If you can, I'd like to hear it?? I'm using Amazon's wishlist system again this year... works great. Topping my list is a Harmony Universal Remote, V-Moda Vibe Duo headphones, Rockband, and a few CDs. Volumes 10-whatever of Good Eats on DVD or some of the books on my amazon.com catholic or baby wish lists. Most of my physical Christmas wants are on my wish list Web site, but what I really want is to use the Christmas break to finish decluttering my house; scanning all my documents so I can get rid of old papers; and scrapbooking photographs I care about so I can discard the rest. I am serving in Americorps this year, so I need a few basic things... bike fenders, a face mask for the winter, and warm socks! Also, books are always good. I've really been missing the opportunity to take classes. I've asked my family to either teach me things (photoshop, watercolor painting), or to get me a class. A local nonprofit had a silent auction and a belly dancing class didn't get sold. I'm hinting to my husband to call in and make an offer on it. I've asked my newly-graduated chef son to cater a small dinner party - I'll provide the food if he would cook. I'm after a decent food processor. Doesn't need to be expensive, but this year I got to the point where my 20+ year old Moulinex with the turn crank wasn't getting the job done, and my hummus habit burnt out my blender. I'd also like a wall mounted magazine or file rack. I often have 3 or four files that I need to grab quickly, and they clutter my desk. Jeez! I'm pretty easy. I've been racking my brain for an unfulfilled desire and finally realized that I don't want anything tangible - tough to come up with a wish list last year, too. We've got the important stuff and wallow daily in gratitude. That really takes the edge off the acquisitive impulse. Maybe some of those cushy wool socks. And I can think of a cookbook or two. Maybe a big bucket of seaweed salad or fish roe. Yeah, that would be good. But with or without, I'm good. All I want for Christmas is my two front. . . . well, no. Better than that, I would LOVE a Kitchen Aid stand mixer. Alas, too expensive for my budget! Second choice, something from an "of-the-month-club." I don't know why, but the thought of having a special package just for me delivered each month just tickles me! It's like Christmas 12 times a year! All I want for Christmas is for my brother and sister to remove themselves from my couch and get a job and place of their own. They came for a visit three months ago and just can't seem to leave. I've even threatened to call our mom, but they don't seem to be afraid of her anymore. I know I'm getting older b/c the only thing I really want is a new dishwasher!!! I would really like to have enough time to finish writing my master's paper and get my MA done and over with. After that was done, I'd like a new job that uses my degree and that pays well. A vacation to someplace warm would be nice too. I wish I could go back to when my dog was a puppy and not have to watch him get old. He's a 12 year old Siberian Husky. I actually have already finished my Christmas shopping, so that means the whole month of December is ME shopping. My ideal wish list would actually be for VISA or AMEX gift cards, so I can use them to buy whatever when it goes on sale. What I want for Christmas is a dog. Our 10-year-old dog died in August and our younger dog and I are lonely. My husband and I have been married for 22 years and we've always had dog(s) and a cat. My surviving dog would love to have a playmate. I would get this dog from a shelter or rescue. I desperately need a new vacuum cleaner, but I actually did ask for an amazon GC this year because I love to read! I love the posts about the dogs the others made. I wish my dog could live forever, but he's 11 so I know we don't have many more years together. He's the best dog I ever had & I'm just cherishing each day he's here with me. "I wish my dog could live forever, but he's 11 so I know we don't have many more years together." Unfortunately, my darling boyfriend has decided to ignore my simple list (and my added request for him to paint our living room with the light grey colour we already own) and buy me other things instead. Other, more expensive things. *sigh* It looks like Christmas isn't going to be as frugal as I had hoped. well, there are too many things that i wished for xmas, but i guess that $25 Amazon Gift Certificate would be nice. I just moved across the country, so my main wishes right now are money for a ticket home for Christmas (well, it's been purchased and paid for, but it'd be nice to not have that hole in my moving-depleted savings), and the time and money to be able to join my family on the annual family vacation this summer. It's the first time I've lived more than a 5 hour drive from my hometown, and while I'm not homesick and I adore my new city, I'm realizing how much I took for granted having them close. I'm a single mom of four kids. For Christmas, I'd love to be able to buy the house we are renting. The owners need to sell it, but I don't qualify for a loan. We love the house, the yard and the neighborhood. The face of God is a kaleidoscope. Depending on the time of day, the day of year, or millennium for that matter the face of God looks different. Ultimately, it depends on the viewer. The face of God is that which he (or she) allows his (or her) creations to see at any given moment in time. For some, it's a bearded caucasian in Charlton Hestonesque robes and Cecil B. DeMille bombast, for others, it's George Burns or now Morgan Freeman. But for over 3000 religions to see different images of what is possibly the same entity, for some not to see the image at all, or still others not to believe an image exists or not to be sure what its existence or their own means, the face of God changes slightly every second the Earth rotates upon its axis. This is the first year I can't really think of anything that I want for Christmas...all I can think of are a few books, a rice cooker, and maybe some nice sweaters for work. It's funny about wish lists--as I get older, I don't wish for any stuff, because it's just more stuff that I have to find a place for. I remember when I was a child, and my grandmother told everyone in the family that she didn't want anything except a new broom. She got it and was happy. Now I understand that completely--what I want is a new cookie sheet, and it's on my Amazon wish list, but I bet I don't get it. (I would throw away my old one to make room). My house has reached that critical 10-years of age, which means things are starting to need replacing... For Christmas this year, I'd like one or both of the storm doors that need to be replaced. for Christmas i would like an iPhone. I would like an iPhone because my family has very very very little money... my dad is always working and hes never home... my mom lives a state away. I want an iPhone so i can gie it to my father for christmas becuase he deserves one.... I want to give him an iPhone becuase i am always worried about him and he cant call home. he used to have a cell phone but now he doesnt have the money to pay for the bill.. PLEASE CONSIDER THIS. It would be a great pleasure.